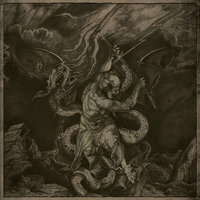 BARSHASKETH is a Black Metal band formerly located in New Zealand but now based in the United Kingdom; this self titled album is their fourth full length. This album was very difficult to review but I like a challenge—however, it did test me a few times. The first track, “Vacillation,” isn’t the best example of what the band can do. If I wasn’t required to listen to the whole album as a reviewer, I would had not continued on with this album, based on this track. Likewise, If I were a Black Metal fan searching for some sweet, sweet darkness on Spotify or YouTube and this track popped up…the band would not had caught my attention. There isn’t anything wrong with the track, per say. In fact, someone who is more of a Black Metal purist might really like it. It is fast, furious, and full of loathing. However, it just doesn’t stand out to me. The riffs aren’t very interesting and the song seems to go on far longer than its five and a half minutes or so. The second track, “Resolve,” is much in the same vein—a track written and played by talented musicians but lacking anything interesting enough to grab me. However, things begin to look up after these first two tracks, particular with the next four. “Consciousness I” and “Consciousness II” are both filled with great riffs—tremolo but also with some nice groove and just a hint of blackened melody; a cold void of dissonant riffage. On these tracks, BB’s bass guitar really stood out to me as well and is a nice contrast to the band’s cold atmosphere. The ambient beginning of “II” really highlighted the bleakness of it all—I wish the band included more moments like this. Still, these two tracks standout as highlights of the album. “Ruin I” is an immediate attack on the senses but it seems so much more focused than the first two tracks. The blackened vocals are in perfect balance with the riffs here and the song just sort of pushes into you and doesn’t let up; it is a sort of intensity that feels searing but, at the same time, provides a sort of smooth ride like the fluid motion of an executioners ax falling upon someone’s head. “Ruin II” is almost the exact opposite of the first one, which is to be expected. This track opens with a slower tempo with more methodical guitars and drums. However, that quickly changes especially with the double bass. MK really shatters this song to pieces, his foot work devastating like a galloping horde of demons approaching, battering and clamoring for your blood. This is an enjoyable record, especially for Black Metal purists but if you are looking for something that works outside the box, or BM that introduces unconventional elements, you might find yourself looking for another album to wet that appetite for your more atmospheric or progressive needs. If the band had expanded on the concepts presented in the “Consciousness” and “Ruin” tracks, I could definitely understand giving it a higher rating.